Language for Little Learners | M&Ms, French and YOU! Have you ever wondered how many red M&Ms are in a snack size bag of M&Ms? Maybe today is your day to find out. 1. Give each of your children a small bag of M&Ms. 2. 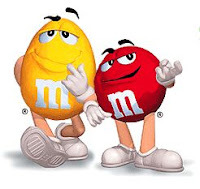 Ask them to sort the M&Ms into colors. Practice the French colors while you are grouping them. 3. You can make a chart to see how many M&Ms of each color are found in a bag. 4. Draw a row for color and a column for different amounts. 5. Ask your children to count out loud, in French, how many M&Ms they have of ‘bleu, vert, etc.’ 6. As they tell you how many they have, you can fill in the chart or for slightly older kids you can have them fill out the chart themselves. 7. Afterwards, you and your children can eat the M&Ms as a reward. Variations – You can use skittles instead of M&Ms or any kind of colorful candy. You can even use a hand full of colored cereal like Trix or fruit loops. ← Creating a Menu in French with your child!